Pharmacy managers in South Africa are often overwhelmed trying to address several daunting workplace challenges at once, such as making sure there is an adequate supply of pharmaceuticals managing efficient quantification of needs and ensuring the optimal use of medicines. Through the Pharmaceutical Leadership Development Program (PLDP) developed by the USAID-funded Strengthening Pharmaceutical Systems (SPS) Program, led by Management Sciences for Health (MSH), however, they now have the opportunity to apply leadership and management principles to better develop actionable and measurable results. Launched last year by the SPS Program, the PLDP presents a novel approach by combining pharmaceutical management knowledge and sound leadership practices to better equip pharmacy managers to respond to challenges in their workplace. monitor and evaluate their progress towards achieving their desired result. The SPS Program adapted the LDP specifically for pharmacists and added sections on legislation, ethics, governance, financial management and human resources. At the end of the course participants present their results to senior managers and other key stakeholders. 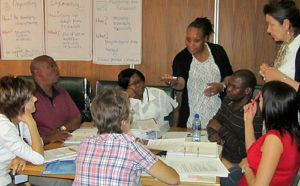 The PLDP pilot was conducted in South Africa’s Gauteng province from March to August 2011 with a group of 17 pharmacists from the Gauteng Provincial and Tshwane Metro Departments of Health. A further group from two more provinces namely Free State and Northern Cape completed the course in April 2012, with a third group in the Eastern Cape commencing in January 2012. The Free State and Northern Cape groups addressed several challenges they face daily including the readiness of clinics to supply antiretrovirals (ARVs), compliance with Standard Treatment Guidelines and correct administration of antibiotics, improving adverse drug reaction reporting and improved medicine supply management in a rural clinic. Expansion of PLDP to other provinces in South Africa is being organized under the SIAPS Program, while opportunities to to find a more permanent home for the program at a South African training institution are being explored.